It is likely that your child will eventually grow out of their eczema. But while they are affected, the key to controlling it is to keep their skin well moisturised, to bathe regularly and to use topical (rub-on) steroids when they need them. Antihistamines can sometimes help, and it is important to manage any infections. 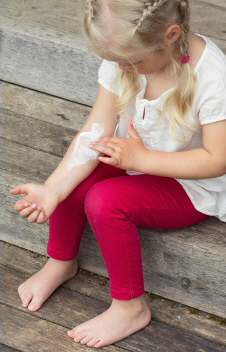 Moisturisers (often called emollients) help to put moisture back into your child's skin. Normal moisturising lotions aren't enough, but there are many different moisturisers specifically for eczema. They are available as creams and ointments. Ointments moisturise better than creams, but tend to be thicker and more oily. Because of this, some people like to use a cream during the day and an ointment at night. To prevent infection, keep your fingers and hands out of the moisturiser tub. Remove a dollop with a spoon and apply a thick layer, moving in the direction your child's hair grows. Don't rub it in – their skin will absorb it in about 10 minutes. Your child can't overdose on moisturiser. Apply the moisturiser as often as you need to keep their skin moist – if that means every hour, then do it every hour! You should be using about 500 g of moisturiser on their skin every one to two weeks. If applying moisturiser stings your child, it is most likely because their skin is still too dry and they need more moisturiser. You can buy moisturisers at the pharmacy, but it is usually cheaper to get them on prescription from your GP. Don't use aqueous cream as a moisturiser. It is intended to be used instead of soap, so keep it for this purpose. Having a bath or shower every day will help to rehydrate your child's skin. The following guidelines will help to make sure they get the most benefit out of their daily bath or shower. Use warm water, not hot, and limit the bath or shower to 15 minutes at the most. Don't use soap or liquid soap, as these can dry out your child's skin. Instead, use soap substitutes such as aqueous cream or emulsifying ointment (you can buy these at a pharmacy or get them on prescription from your GP). Put them on before your child gets into the bath, or shower, then wash them off. Use bath oil to help moisturise their skin or dissolve a teaspoon of emulsifying ointment under the hot tap as you run the bath. But be careful as bath oil can make the bath slippery. Use a bath mat for safety. If you wash your child's hair in the bath or shower, use a special shampoo that has fewer irritants. If you use a normal shampoo, make sure you wash their hair over a sink, rather than in the shower or bath, so the shampoo doesn't touch the rest of their skin. If your child often gets skin infections, it may help if they have a bleach bath once or twice a week. Use plain bleach without added fragrance or detergent. Bleach comes in different strengths, so the factsheet tells you how much bleach to use for each strength. If your child has showers rather than baths, add a gel like Microshield to your soap substitute twice a week to prevent infections. After your child gets out of the shower, pat their skin dry (don't rub), and then apply moisturiser immediately. Your doctor may prescribe a steroid cream for your child and give you specific instructions on how to use it. There are different types and strengths of steroids. Use the strength necessary to get relief – usually no more than 1% hydrocortisone on your child's face. Your doctor will let you know what strength is best for your child. Unlike moisturiser, which you should apply liberally, steroid creams need to be applied thinly. A useful measurement is called the finger-tip unit. One finger-tip unit (FTU) is a thin line of cream from the last joint of an adult's index finger to the tip of their finger. This table shows how much steroid cream to use for different age groups. The links below are to age-specific leaflets, which also show this using diagrams. Apply your child's moisturiser first, wait 10 minutes, and then apply the steroid cream. One FTU is enough for the face and neck, or the hands and feet, or one arm in a 3- to 6-month-old. You can also read more information on Patient.info about using topical steroids, including how to apply them, side effects, and common mistakes when using them. Pimecrolimus – A topical steroid-free medication, which can reduce inflammation and itching. Antihistamines – Antihistamines can reduce itching and scratching, especially at night, but are generally only prescribed for a short time and not for children under 2 years old. Check with your doctor or nurse before giving your child an antihistamine for eczema. Wet wraps – Wet wraps help to cool your child's skin and ease itching. Talk to your doctor or nurse about the best way to use this treatment for your child. Do not use strong steroids under wet wraps. What if my child's eczema is not getting better? If your child's eczema is not getting better, despite treatment, or is getting worse, you should go to see your general practice team. Your doctor or nurse may suggest stronger topical steroid creams to get the eczema under control. They may also check to see if any other condition, such as a skin infection, may be contributing to your child's skin problem. Written by HealthInfo clinical advisers. Last reviewed March 2017. Last updated March 2019.